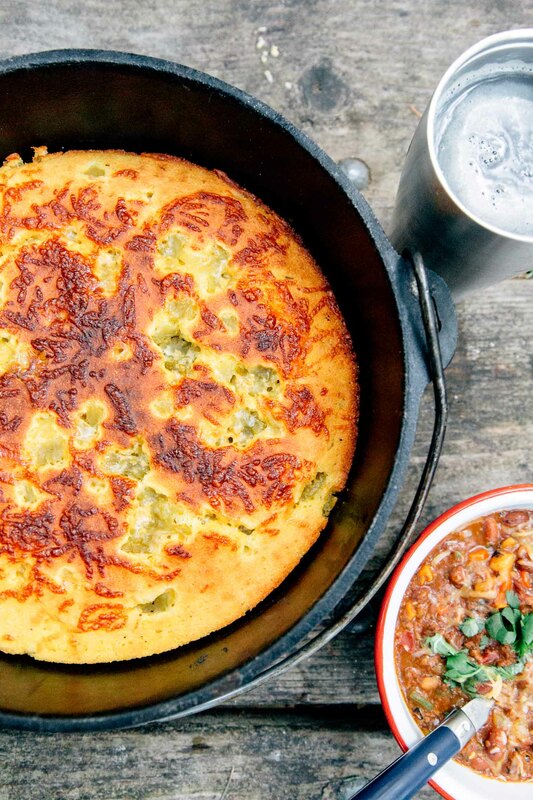 Featuring green chiles and sharp cheddar cheese, this Dutch oven cornbread recipe takes camp comfort food to the next level. 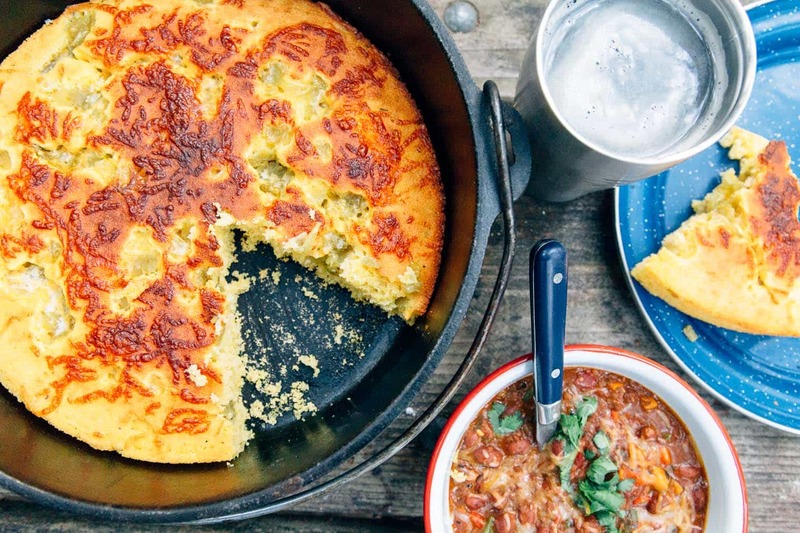 Cornbread is one of our favorite autumn camping foods. Usually, we make it using our campfire skillet technique, but if we want a nice crisp on the top of the bread, then it’s time to fire up the Dutch oven. Nothing bakes cornbread to golden perfection like a Dutch oven! This recipe is super simple to pull together. At home, you can mix together the dry ingredients and store them in a sealable container or baggie. 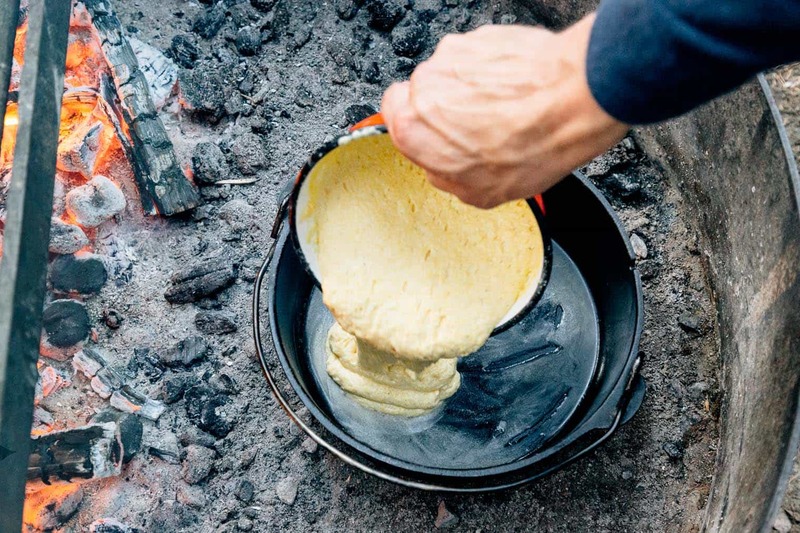 Then, in camp while you prepare your coals, you mix the dry ingredients with some milk, an egg, and a bit of honey. One such occasion is the autumn chile harvest. Towards the end of the summer, tons of green chiles are harvested throughout the southwest and distributed all over the country – the most famous being the Hatch Chile harvest. If you can get your hands on some fresh Hatch chiles, consider yourself lucky. But if you’re a little late, there are still plenty of canned and frozen options you can pick up from your local grocery store. 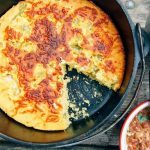 The result is a spicy, cheesy cornbread with a lightly browned top that is perfect for pairing with a hearty bowl of chili on your next fall camping trip. Hands down, the most versatile piece of camp cookware we own is a Dutch oven. This piece of equipment opens up a whole new world of cooking options: you can cook stews, bake lasagna, braise chicken, and of course, make this cornbread recipe! It can be used on a camp stove or directly over the fire. The short legs and rimmed lid allow you to place embers/coals on top as well as underneath, cooking your meal from both directions. Light 24 charcoal briquettes or start a campfire if you want to use wood embers. 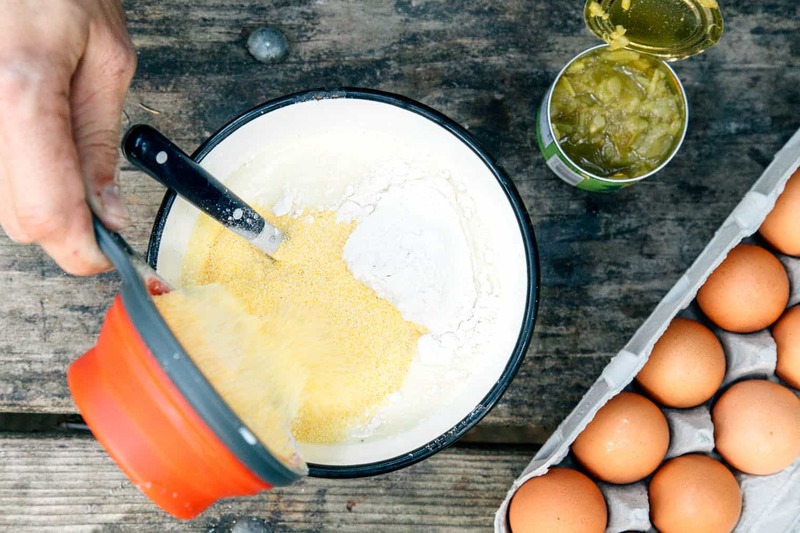 In a mixing bowl, beat the milk, egg, and honey together. Add the dry ingredients (cornmeal, flour, baking powder, and salt) and stir until combined. Move 7 of the charcoals or embers into a ring and place the Dutch oven on top. Once hot, add the butter to melt. After the butter has melted, pour in the cornmeal batter. Sprinkle the green chiles and cheese over the top. Cover the Dutch oven and place the remaining 17 charcoals or embers on top of the lid to create an oven heat of about 425 degrees. Cook for about 20 minutes, until the middle of the cornbread has cooked through and the top is beginning to brown. Carefully remove from the heat, serve & enjoy! I would like to make this at home. How should I adapt it for my oven? Make the batter the same, pour it into a bread pan or Dutch oven without covering, place in a 350-degree oven. Now, we’re not positive about the time, because we haven’t’ tried this method before, but I’d suspect probably 18-20 minutes. Keep an eye on it.